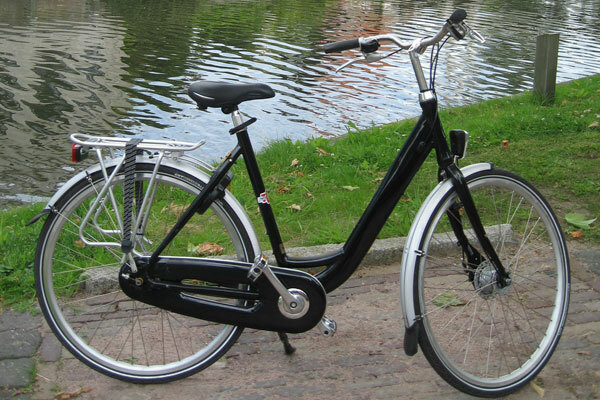 Combine bike and boat to journey through the contrasts of Southern Holland. Easy going cycle paths link the futuristic city of Rotterdam with traditional craft towns of Delft, Gouda and Schoonhoven. South of Amsterdam the River Vecht flows to the imposing Dom Tower of Utrecht. From here you’ll cycle and sail Holland’s ancient river paths through Europe’s busiest port, Rotterdam to the gin town of Schiedam. 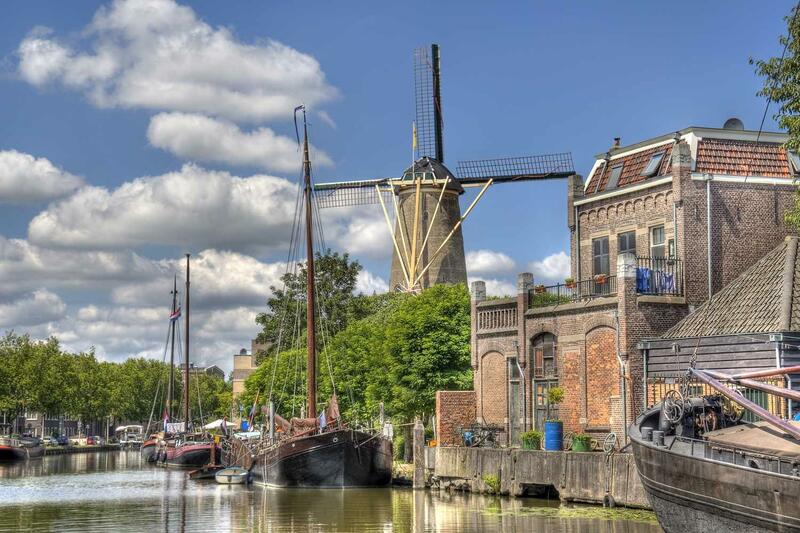 Along the way you’ll encounter the traditional potters of Delft, discover the cheese craft of Gouda and lose count of the perfectly preserved UNESCO windmills of Kinderdijk. Returning each evening to the comfort and calm of your boat makes for a very hassle free adventure. On arrival your cabin will be available from 2pm and the rest of the afternoon is yours to explore the canals and history of Amsterdam. In the early evening, your boat crew will provide dinner and a welcome briefing of the week ahead. Your first sailing takes place during breakfast, to Breukelen. From here you’ll cycle along the winding River Vecht passing small castles and windmills as you make your way to the imposing Dom tower of Utrecht. From here, you’ll re-join your boat and sail onto Rotterdam. Today cycle via the city of ‘Jenever-city’ to Delft. Jenever is a Dutch produced gin from this town, while Delft is home to the locally produced pottery from the area and you have the chance to visit the Delftware factory, a real highlight. 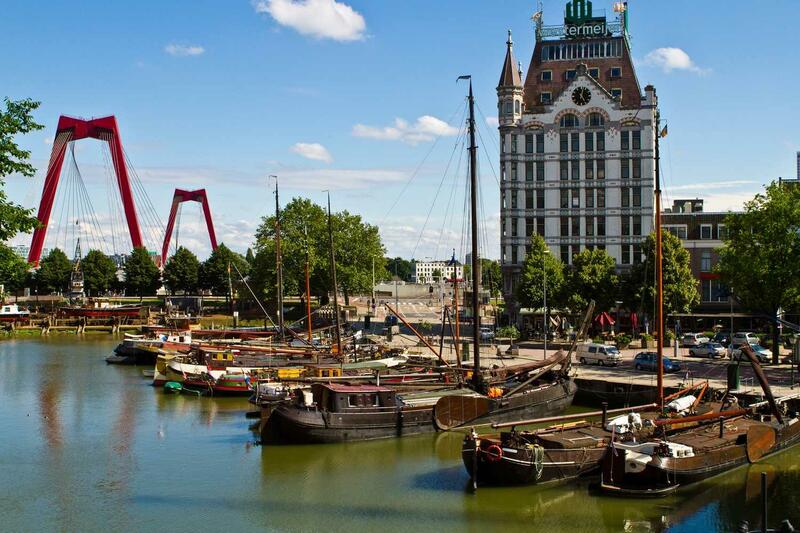 Afterwards cycle back to Rotterdam where you can join a guided city walk in the evening. This cycle day offers you a couple of options that may depend on how your legs are faring! Initially visiting the UNESCO World Heritage Site of Kinderwijk and its incredible row of 19 consecutive windmills. At this point the hardy can opt to cycle the longer route which takes in the famous cheese city of Gouda! The shorter one goes through Alblasserwaard before both end in the ’silver city’ of Schoonhoven, where you can visit a silversmith. 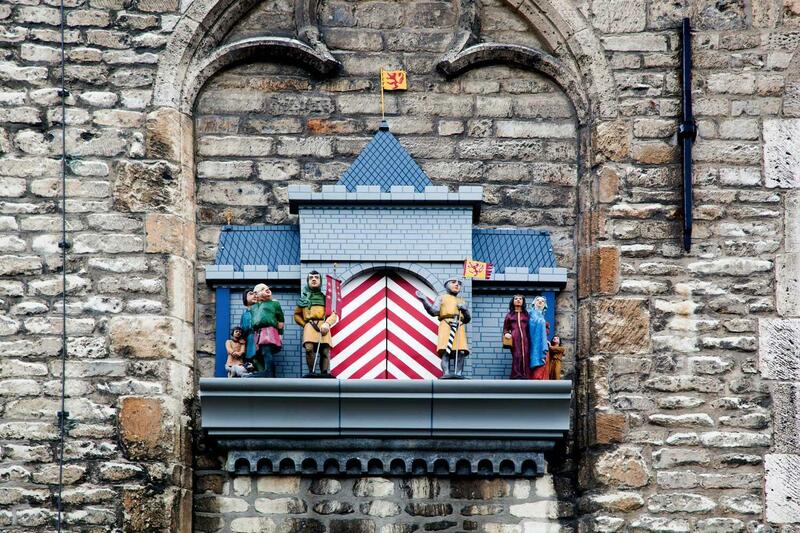 Today takes you through the ‘Green Heart’ of Holland via Oudewater to Utrecht again. 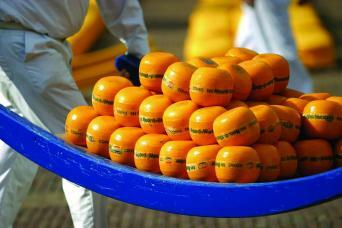 Near Oudewater you can visit a traditional cheese farm to sample the delicious Gouda. Later that afternoon you’ll sail from Utrecht to Haarlem. Another fantastic loop cycle today with a couple of choices again. Both tours head through the stunning Kennemer dunes where you can spot Highland cows, bird species and Shetland ponies. After visiting the seaside resorts of Bloemendaal and Zandvoort, enjoy cycling through forest fringed lanes back to Haarlem. 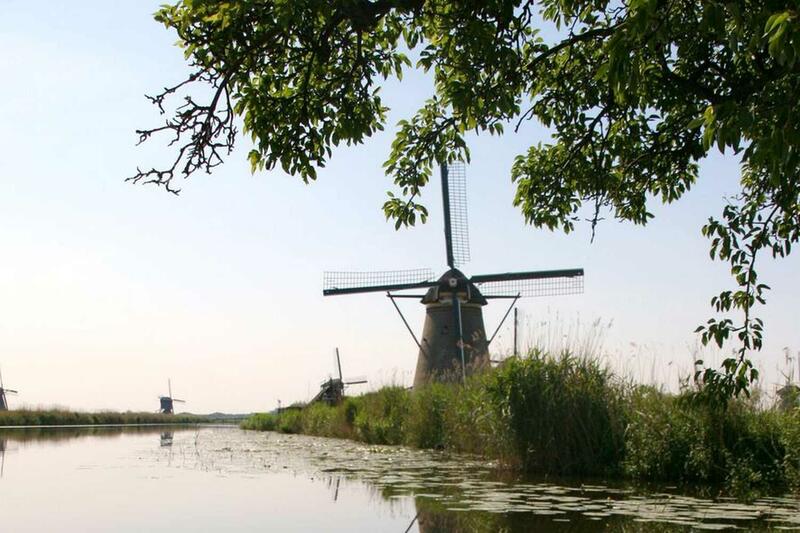 Your final day’s cycling takes you from Zaandam to the open-air museum ‘Zaanse Schaans’ which is a true snippet of Dutch culture! 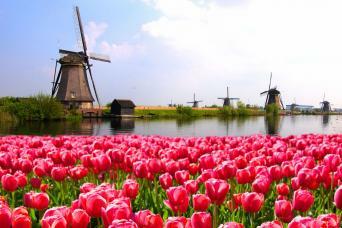 Enjoy traditional wooden houses, windmills, a cheese farm and wooden shoe ‘clog’ manufacturing. 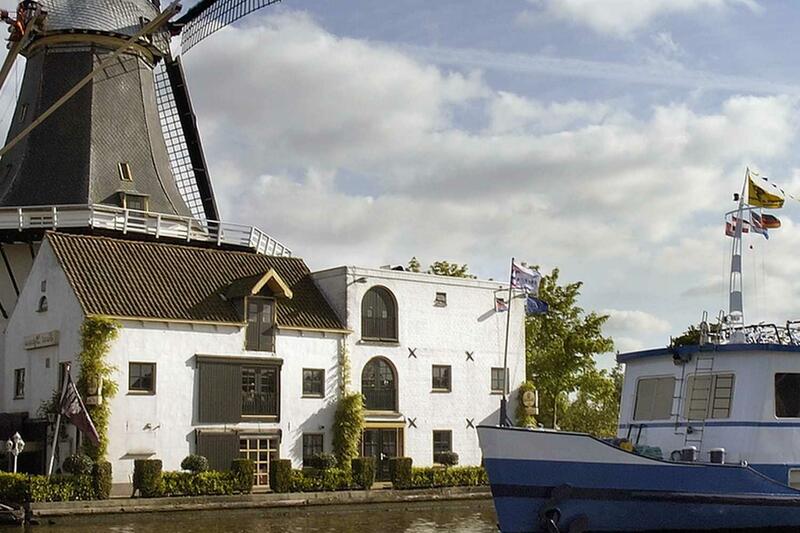 The short distance today allows time to explore the waterways of Amsterdam. 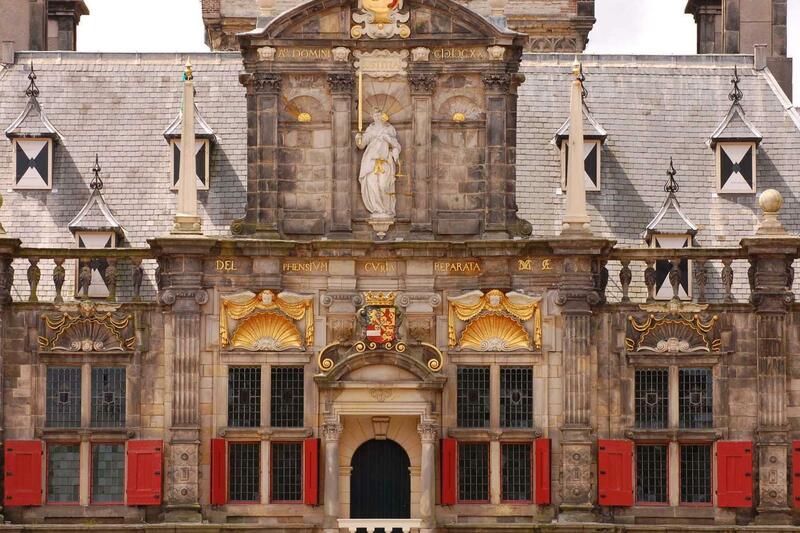 Depending on your onward travel arrangements, you may like to further explore Amsterdam. Your on board crew will be happy to help with onward taxis should you require. 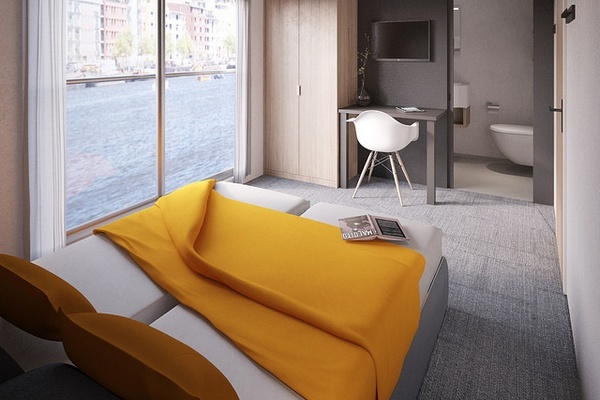 You will spend each night on the boat in your very comfortable cabin. cabin. 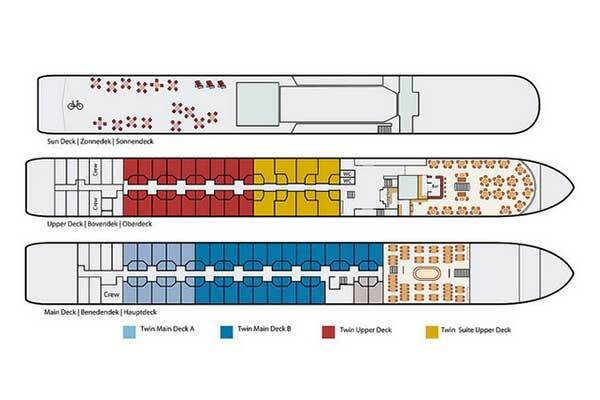 There are also a small number of upper deck suites available. Your boat is always docked at night and only sails during the day. Single cabins are available although a supplement is payable. This trip is also available to solo cyclists (with a supplement) and is perfect as there are plenty of people to chat with every day. All meals on board are included. The 56 cabin river cruiser ‘De Amsterdam’ will be your floating hotel for the week. 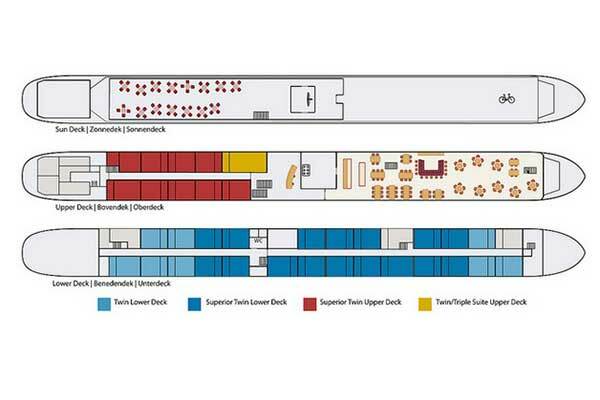 This lower deck offers 10 twin cabins and 20 superior twin cabins. 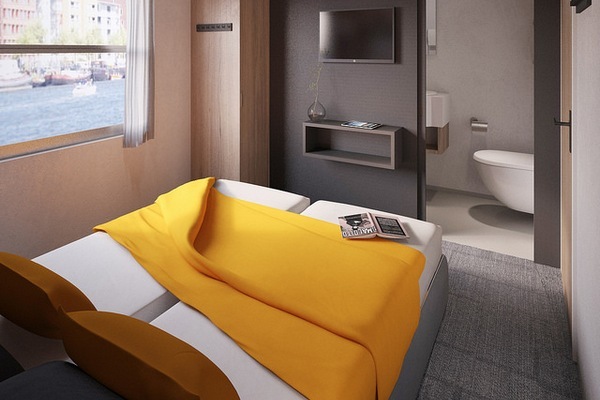 All lower deck cabins are en-suite along. Facilities include climate control, TV, hairdryer, mini safe and wardrobe. All cabins have a window that can be partially opened. Superior twin cabins will be further away from the engine room. The upper deck accommodates 18 superior en-suite cabins (identical to the lower deck superior cabins) and 8 spacious suites that have floor to ceiling sliding French windows along with the added comfort of more space and a mini bar. Enjoy a warm welcome from the crew as you board. Enjoy the spacious deck to soak up the last of the sunshine. The bar and restaurant area is perfect for gazing out over the river while you enjoy a cold beer after a day of cycling. easily stored in the cupboard or under the beds. The boat is always docked at night and sails only during the day. 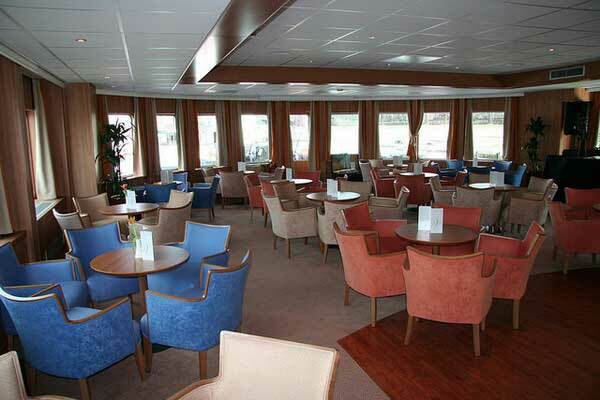 All inside areas of the boat are non-smoking and a limited wifi service is available. The De Holland River Cruiser also operates a small number of departures on this trip. 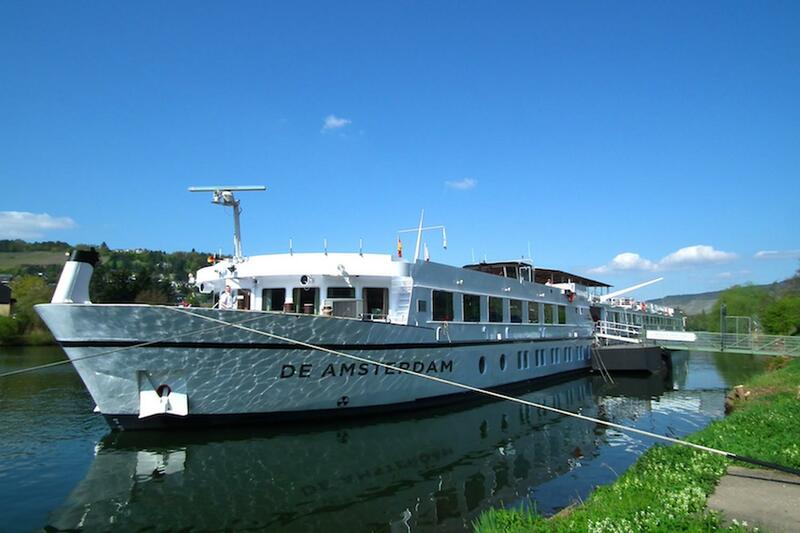 The ‘De Holland’ is a 34 cabin stylish river cruiser. 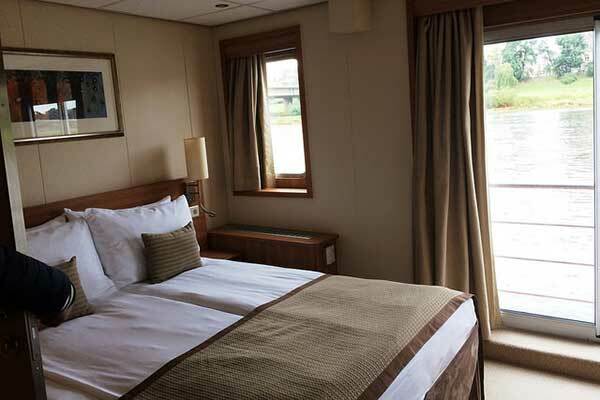 The lower deck has 24 en-suite cabins with windows (non-opening for safety reasons), TV, air conditioning, a hairdryer and a twin bed configuration (either side by side or in an L-shape). 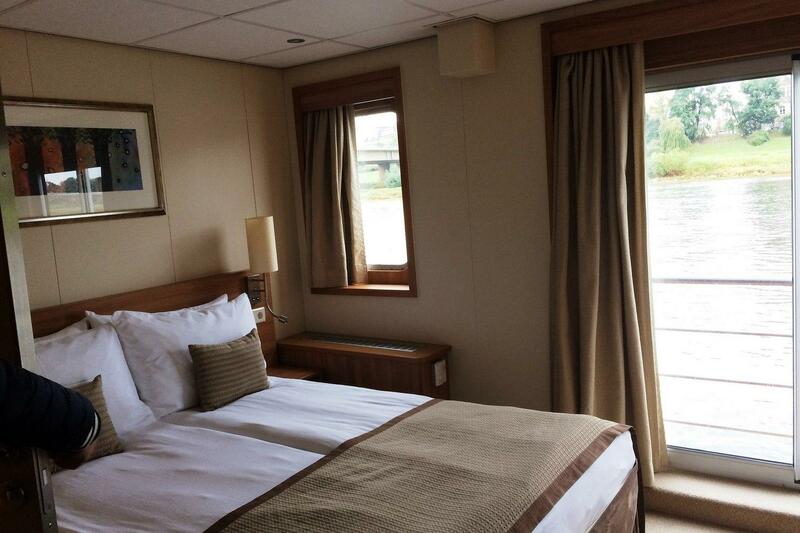 The upper deck offers 9 larger superior cabins with floor to ceiling sliding French windows. The is also 1 suite complete with mini bar and sofa. October. Please check the website for departure and availability. Almost completely flat this cycle tour is graded easy. The daily distance range from 25km-60km. You will be cycling along designated traffic free cycle paths and some quiet roads and along some busier routes through when approaching and departing towns and cities, so please be mindful of other road and cycle path users at all times. This tour is particularly well suited to novice cyclists as the route is flat and predominantly traffic free. However, you have the option of staying on board or exploring locally on foot if you don’t feel like cycling. You will be issued with tour specific route notes and maps upon arrival. Your on board tour leader will also give you a briefing each evening or in the morning about the days cycle. Each daily ride is not guided but the on board tour leader will be cycling the route each day and be available on their phone should you require assistance. Each day usually follows the ‘Cycle Junction Network’ which takes you safely through the Netherlands. The route is way marked throughout and we supply you with a detailed route map, guidebook and information pack so you will have no problem following the route. You will also be provided with an emergency telephone number for the trip. recommend that you bring your own helmet with you for safety reasons. Due to very restricted space on board there is limited availability to bring your own bike – please check with us. The distances and ascent/descents are approximations of the recommended routes. Please be prepared by packing all necessary items, for example, proper rain gear (jacket and pants), sun hat and sun screen. Your information pack has a detailed equipment list which includes standard cycling gear such as good cycling shoes, warm and waterproof clothes for the cooler months, lightweight clothing for summer, and a day pack. By Air - Amsterdam Schiphol Airport just outside Amsterdam, is a major European airport and is served by direct flights from most major UK and European airports as well as international destinations. By Train - Amsterdam is linked with London, either via Paris or Brussels (around 5 hours) by high speed train. Visit Rail Europe for prices and booking. By Ferry/Car - Ferries from the UK to Holland run from Harwich to the Hook of Holland, Hull to Rotterdam and Newcastle to Amsterdam. Direct Ferries lists prices and schedules. We suggest you book as soon as your plans are finalised in order to secure you preferred cabin choice. 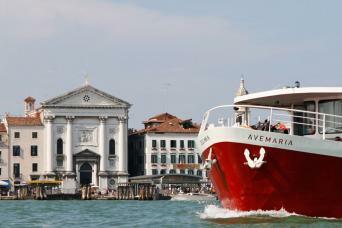 This tour is particularly popular between the months of June-September. If you don't want to cycle it is possible to relax on the boat as it moves to the next port of call. Please always talk to the on board tour leader to discuss options. What a wonderful holiday - I could have stayed on board for another week! The boat and the crew were absolutely first class. We stayed in the most beautiful cabin - with the large sliding glass doors. The fixtures and fittings were top drawer and everywhere you went was spotlessly clean. Our cabin was large and well fitted out with everything we needed. Each cycle trip was well mapped out/explained for us and we were given a detailed map and route sheet for each day. The cycling was easy and the routes were varied and interesting, taking in local points of interest. Discounted tickets for the Royal Delft Factory/Museum and an Amsterdam canal tour were a welcome addition to the itinerary. The bikes provided were great quality and in perfect condition and the provision of panniers, water bottles and waterproof map-holders were very welcome and thoughtful additions. The only negative point I will mention was the quality/style of food presented for dinner. My partner and I found the evening meals rather bizarre and unfortunately not really to our liking. We were looking forward to local cheeses, herring, flammekuchen, fresh local produce etc. but were a little disappointed in the event. However, we skipped dinner on three nights and ate out in Delft at Bij Ons, which was one of the best meals we have ever had, anywhere, and for €31 per person it was the best vlaue for money. 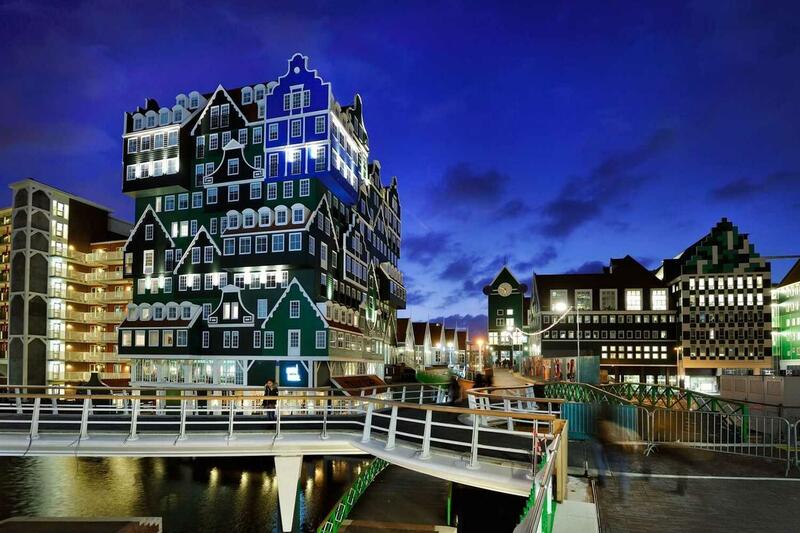 We also ate out in Zaandam at the Castell and in Amsterdam at the magnificent Sea Palace - somewhere not to be missed both for it's fantastic food and its breathtaking decor. We cycled 5 out of a possible 6 days, opting to spend a day cruising on the boat in the middle of the week. This was not only a welcome rest for our derrières but also a wonderful way to take in the beauty and bustle of the Netherlands waterways - never a dull moment. This holiday was absolutely fantastic, so good infact that my partner and I are already looking to book the Danube trip for 2019. The barge moves at perfect times, while people are cycling or during dinner and then you watch the scenery out the windows. The barge is extremely stable. The major complaint I have is that this is an exercise vacation and water is NOT provided, which is ridiculous . If this product is being offered to Americans then offer water! Charge more for the trip and make water available 24/7 at no cost. This trip exceeded expectations. Food was plentiful and better than expected. Staff extremely helpful. Accommodations clean and comfortable but cramped but the dining room/lounge provided a very comfortable setting to hang out with friends. If you are planning on doing this trip bring as little as possible! I liked being able to bike at my own pace. Since this was self guided my friends and I enjoyed the freedom of visiting what interested us along the way rather than being held captive by a group schedule. Maps and directions provided were quite clear but we still managed to miss at least one turn every day! The Dutch people, who almost universally speak English well, were very helpful in getting us back on track. OUTSTANDING VALUE compared to other trips I have taken. I never expected such service and quality meals for the price I paid. We had a great time. Even with fickled weather we had a ball. This is great for folks of any age and experience level. I woyld5do it again in a heartbeat! This was my first introduction to bicycle holiday and what better way and place to do it. Beautiful, save cycle paths, pretty towns and sites, and the fun of navigating like a "girl guide/scout". Getting lost and found is part of the fun and certainly makes you pay attention to your surroundings. A little pre trip cycle fitness and an e-bike upgrade made me the happy adventurer to my father's homeland. Our guide loves her country and supported all of us on our particular and reasonable needs. Accommodations were boat like- functional and mobile- not moving from one hotel to the next is a great feature of the bike boat experience. The directions could have been written a bit more specifically. That would have helped. More healthy greens and not overcooked veggies would have suited us better. Other than that, great fun, great bike and tour support, great accommodations. Enjoyed very much! Day 1: Arrive in Amsterdam, embarkation. Day 2: Cycle Breukelen to Utrecht, 30km-40km. Day 3: Loop Ride Rotterdam, 30-50km. Day 4: Cycle Kinderdijk to Schoonhoven, 30km-60km. Day 5: Cycle Schoonhoven to Utrecht, 40-50km. Day 6: Haarlem and North Coast, 40km-50km. Day 7: Cycle Zaandam to Amsterdam, 30-45km. 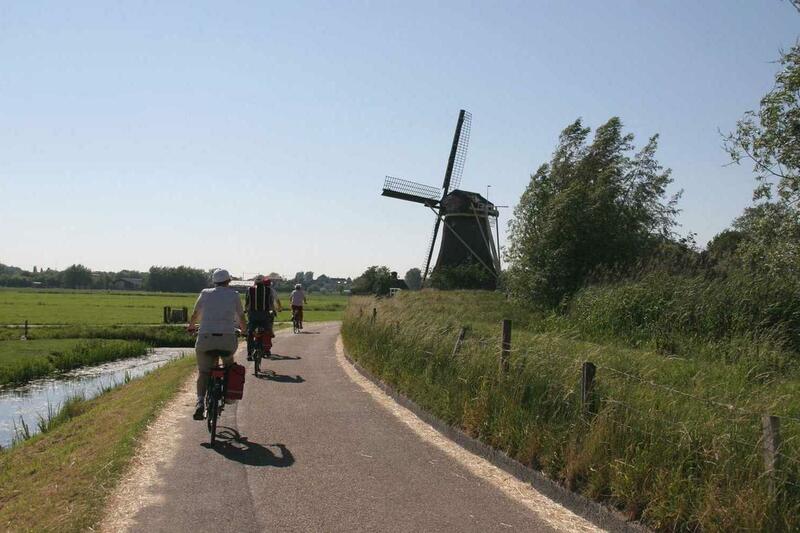 This boat & bike tour is well-suited to those who want easy flat biking on cycle paths, small roads and canals paths through many iconic sites and towns of Holland. There are ample opportunities to take a break in a typical Dutch cafes and you can always head out on foot if you want a day off the bike. At the end of each cycling day you'll re-join your comfortable river cruiser to enjoy on-board hospitality.